Operatives of the Economic and Financial Crimes Commission, EFCC, Ilorin Zonal Office have arrested eight suspected internet fraudsters, following a tip-off and surveillance carried out around Irewolede, Ilorin, Kwara State. 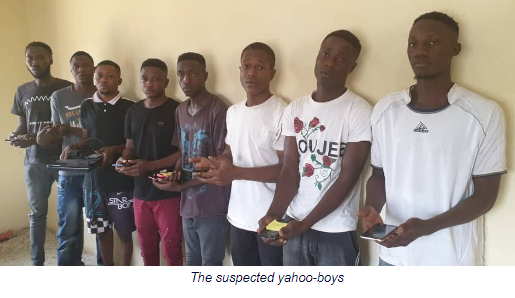 Chimezie Paul, 19; Oluwakayode Adebayo, 25; Mustapha Akeem, 19; Ezedigboo Paschal, 19; Mustapha Suleiman, 21; Mohammed Umar Faruk, 25; Abolarin Samuel Sunday, 23, and Anolarin Ridwan Gbolahan, 25. Among items recovered from them were laptops and mobile phones. They will soon be charged to court.